When I was young in the Underdark, I practiced with the spiders for hours every day. But I also practiced at the magiks. I studied for years and years, but I was never able to do much of anything. It was my Drow mother’s hope that I would be a wizard but all of the practice and training never amounted to anything. After years and years it was becoming clear that I would never be a wizard. Still I practiced hours every day, spent hours with the spiders and prayed every day to Lolth to recognize my devotion, to grant me some power and to make me Drow. For years this went on…Finally I lost all hope and gave up my training, the spiders and the prayers. During my training times, I would sneak off and explore the Underdark. One day I was in an old ruin part of the city. As I explored, I found a hidden passage way to caverns under the city. For months, every day I would sneak away and explore the caverns. This was a place that was ancient, in all my studies I never read anything about this place. How could people not know of its existence? The artifacts that I found there, seemed to not be Drow, but something completely different. And the magic, it was so powerful. I had always failed with the magiks, but in that place I could do everything. I was powerful and strong. .. but every night I would return home and it would all be gone again. And all of the sadness and loneliness would come rushing back. I was nothing again. This happened night after night, till I decided to run away and stay in the caverns. I would rather be alone in the caverns and have power than live above as nothing. So I packed my stuff and escaped out into the ruins. I went deeper into the ruins than ever before. As I ventured further in, the rough cave walls changed to cut stone. Then the cut stone changed to detailed carved architecture. It quickly became clear this was a temple, but to who? And the further in I went, the more power I could feel. It was driving me forward. Until, at last, I reached a large room with an elaborately carved seal. I reached out and touched the seal – there was so much power right on the other side. But it wouldn’t open. There was carved writing all over the seal, but it was no language that I had ever seen. I stayed in front of it for days, trying to understand the language. Trying to understand how to open the seal, trying to figure out how to get to that power. Until getting that power was the only thought left in my mind. I stayed there until I had used up all of my provisions. I had believed I would be able to find food and water in the caverns, but I was wrong. There was no life here at all – nothing. And with no food and little water left, despair began to set in. I knew I had to have that power. I knew it would change everything. But there was no way to get it. I began to cry like I had never cried before. A lifetime of loneliness and failure, of not belonging, a lifetime of disappointment. It all came rushing out. It was too much to bear and I curled my hands into the tightest fist I could make and pounded on the seal and screamed to let me in. I hit it until my hands bled and my throat was raw. I did this for hours, until I was exhausted and there was nothing left. No pain, no tears, no disappointment. Nothing but emptiness. It was in that moment that I gave up and I laid down on the ground ready to be done with everything and just die. It was that moment that the seal began to slowly roll to one side. I sat not moving just watching this door finally open. And then I saw what was inside, it was nothing but darkness. It wasn’t just any darkness, it was thick and inky and neither the light from my torch nor any magic light could pierce it. And then I felt it… there was something in the darkness. Some type of being and that was the source of the power. I was frozen with fear. All this time, it never occurred to me that the source of the power might be a being. With the door open, the power was so strong, it crashed against me like a wave. I started to scoot away from the door. I needed to run away from here as fast as I could. I couldn’t tell what was in that room, but the power was stifling. I would have no chance against what was in there. I couldn’t tell if it was a physical voice or just in my head. But it was all encompassing. I stopped trying to get away and just froze. “Why so much despair?” the voice boomed again. This question was so simple and the answer was all I had thought about for months and months. It had consumed me. I stood up and replied “Power, I came here in search of power”. And that question brought back all of my hopelessness and despair. It rolled off my tongue and I told the story of my life. My birth, being raised by my Drow mother, my life in slavery – not being a Drow, all my studies and my failures. And after all I had said everything about my life, I said “I’m not special – I’m nothing”. “Oh” I replied. Despair filled me. This powerful being had just confirmed what I had believed to be true about myself. I thought of the few items I had brought with me. There was nothing of value. “I have nothing. I don’t think I can pay for it. I want this power! Is there some arrangement that we can make?” The thought of being this close and not getting it was too much. I would do anything to have it. And with that a black column of inky darkness pulled out of the doorway and slide into the room. It moved like smoke and liquid. It swirled around, faster and faster and then it disappeared. In the space it had occupied now stood a gleaming ebony pedestal. I took a few steps towards the pedestal and I could see that there were two items sitting on top of it. One was an empty crystal glass vial. It almost seemed to glow with a faint blue light. The other item was a dagger. But it was not just any dagger. It looked like it was made from darkness itself. The voice said – “I can give you the power you seek for just a vial of your blood”. I picked up the vial. It was so cold in my hand; I thought it might have actually been made of ice. I pulled the stopper out and put both pieced back on the pedestal. Then I grabbed the dagger. A feeling of dread filled me to the point that it took all of my strength to hold on to the dagger and not throw it far away from me. “Fill the vial and you will have what you came here in search of”. I held up my empty hand and let the blade cut into my palm. The blade burned and stung my flesh; I feared that the dagger may have been poisoned. But at this point there was no stopping. Once my hand was cut, I threw the dagger to the ground and picked up the vial. Already there was blood all over the dusty stone floor. I held the vial under my hand and let it fill with the blood pouring from my hand. I was starting to worry how I would get the bleeding to stop. Once the vial was full, I put the stopper back in. I stood there for a moment looking at this icy vial with my blood in it. I knew this was a truly a dark trade I was making. But in that moment, I knew I would do anything for the power that I was seeking. And the greater the power the more I would sacrifice to get it. “Yes” I replied. Confident that I would do whatever to the get power I was after. And the hand reached out and took the vial. As soon as I had given the blood, I knew I might live to regret this, but if I did get the power it might be worth it. The hand, while still gripping the vial, extended out its index finger so that the hand was now pointing at me. “Enjoy your power little fey. “ The outstretched finger touched my forehead. The pain was blinding. I thought I had been betrayed and I knew in my heart I was going to die. Then everything went black. When I finally woke, I reached up and touched my forehead. It didn’t hurt, but I could feel a change in me. I looked at the hand, fearing how bad the wound was, but there was no sign that it had been cut. Then I looked around. The room was empty. The pedestal, the dagger and the blood on the floor – all gone. Most importantly the seal was closed again. I went up and touched it, but there was no longer the power flowing behind it. But I could feel the power in me. I packed up all my stuff and decide to return to my Drow mother. I would show her that I now had power. I would hope that my absent all this time would be forgiven when she show how powerful I had become. I knew she would be angry but she of all people would understand how important my new power was. I made the return trip, from temple to cavern back to the Underdark. I slinked back to my mother’s house. When I entered the house it was empty. It seemed that it was the quiet hours of the day, when people read, prayed and trained. This would mean I would be able to move about the house without encountering anyone. I went to my chambers. I was not sure what I would find. Would my things still be there? Would she have already replaced me with a new pet? I opened the door and saw they were exactly as I had left them. I breathed a sigh of relief. This meant she was hoping I would one day return. With that my heart filled with joy and hope. I dropped all my gear and I ran to her chambers to inform her of my return. I stood outside her door. Never in my life had I intruded into her chambers. I was scared to knock and just stood there looking at the door. Just then one of the house slaves turned the corner carrying a tray of refreshments for my mother. I knew this slave, it was J’ar. He was a kobold and had lived in the house with us for many years. I generally got along with him and was pleased to see him again. Kobold slaves don’t often last long in the Drow houses and I was glad he had not been sent to the pits yet. “What do you want here? You know better than to disturb the mistress in her chambers”. J’ar hissed at me. “No, I’ve been gone for weeks or months. I’ve been gone” I blurted out confused. “You are crazy today. Do not let your mother hear you speak such words or you may no longer find yourself with her favor. You were here at the morning prayer. I saw you. It has only been a few hours since then”. J’ar stated angrily and then pushed past me to deliver the tray. I returned to my chamber. I looked around the room. It did seem exactly as I had left it. Then I saw it. A tray containing the half eaten meal from the day I left. The food was still fresh. I sat on the bed in disbelief that only an hour or two had passed. It didn’t seem possible. It couldn’t be possible. Later in the day, when I saw my mother, I pretended like nothing had happened. She did not question me, no one seemed to know that I had been gone. It was like nothing had happened. I almost felt like it had been something that I dreamed, except for the power. I still had it. I decided it was best to not reveal what had happened. Over the course of the next several months, I introduced my new powers to my mother. Slowly at first, small pieces of magik. I could see the relief in her face. She had started to lose faith in me as well. “I knew you had the spark of the arcane. It just took you a while to learn to harness it”. Shame washed over me, because I knew I had not harnessed it. But it was my power now, it didn’t matter, it was mine. Over the next year I trained every day again, learning to use my new power. I even worked with the spiders again. They never would speak to me, but I enjoyed their company and I confessed to them the events that happened. Spiders can be very good listeners and they never seemed judgmental about things I told them. It felt good to talk about what happened. I had many questions but there was no where I could go to get answers. I never prayed to Lolth again. Those prayers went unanswered. And my power, I had bought with my own blood. There was only once that I tried to return to the caverns. I hoped to look around and see if there were some answers about the dark being I had made a deal with. But when I went to the ruined part of the city, the passage way back to the cavern was gone. After meeting up at the inn, we decide to search for Captain Rond to tell him what we learned at the burial site. The guards suggest that we may find him at the warrior’s guild, so we all make our way there. At the guild, we find Captain Rond training with his men. He gestures for us to approach, and asks if we would like to train with them. We all feel that a bit of combat training would be a good idea. Orsik gathered a group of recruits interested in hammer techniques, and showed them a few tricks. Leshanna practiced knife fighting with a short human. She had difficulty at first, but was soon able to best him. Larksong took up a bow and practiced at the range, doing fairly well. I grappled with Captain Rond, and was able to pin him several times. He was impressed with my technique and asked if I would train with him more often. After the training, we headed to to the inn with Captain Rond to unwind and talk about our findings. We told Rond about the burial site, Douven Staul, the Dark Keep, and our suspicions of Valthrun. He thanked us for the information and assured us that Lord Padraig would be grateful as well. We all wanted to pay Douven Staul a visit and check on his recovery. To our surprise, we found him awake and eager to talk. He had heard there was a dragon horde near Winterhaven, and went searching for it. While he was searching, he encountered Agrid, and was captured and tortured. While he was imprisoned, he heard his captors speaking about their master, Kalarel. He believes Kalarel is a male priest, but does not know any more. Finally, he removed the picture of his wife, Nensi, from the locket and gave it to Orsik. The locket is actually an amulet of healing, and quite valuable. Sister Lenora, the priestess of the temple, insisted that we let Douven rest. I asked if there was an extra room in the temple where I could meditate and spend the night, while the others went back to the inn. At dawn, we gathered at the inn and prepared to go to the Keep. When we left the village, the guards at the gate passed us a note from Captain Rond, who urged us to be cautious. As we approached the Keep, Leshanna sensed old magicks in the area. The path widened to a clearing, with no life whatsoever. The ground was bare earth, without even weeds among the ruins. The complete absence of wildlife lent the area an eerie silence. Someone however had cleared away enough rubble to reveal a stairway leading down. We reconnoiter the area and are unable to detect any traps, neither magical nor mundane, but we do hear chittering sounds from the stairs. Larksong searches the woods nearby and doesn’t find anything threatening, but does find two very valuable flowers. I crept up to the stairs, again finding no traps, and saw flickering torchlight at the bottom. The others joined me at the top of the stairs, and Leshanna told us she sensed magic down the stairs, in the distance. We carefully proceed down the stairs, but unfortunately are not very quiet. At the bottom, we emerge into a large square room, with a large Goblin warrior. He sees us, and grins. After the battle at the burial site, we made a litter for Douven Staul and started back to Winterhaven. We had only traveled about half the distance, however, when we began to smell smoke. Rounding a bend in the road, we came upon a group of Kobolds gathered around the charred remains of a caravan. The Kobolds were chittering excitedly and angrily, throwing whatever they could find at the overturned wagons. Magical flames appeared between the wagons and the Kobolds, and I sensed movement among the wagons. Fortunately for us, surprise was on our side, and we were able to make short work of the Kobolds. As soon as the Kobolds were dispatched, the flames disappeared. The movement I had seen earlier turned out to be Valthrun and Ninaran, both of whom were not as fortunate as we had been. Ninaran was white faced and cradling a bloody arm, so Niva set to work with her healing arts. Valthrun was eager to learn what we found out at the burial site. Upon seeing the mirror, he became badly shaken, and insisted that we go back to his tower immediately. Back in Winterhaven, we followed Valthrun to his tower, while Ninaran went to the inn. Larksong and Leshanna felt that Valthrun was acting suspiciously, and privately expressed doubts as to Valthrun’s prowess as a wizard. Inside the tower, we noticed rows and rows of books and scrolls, and I was able to discern a religious significance in many of them. Looking closer, I noticed that some of the books had symbols matching those on the mirror. The connection triggered a memory, and I pulled out the obsidian figurine we had taken from our first encounter with the Kobolds. There were more matching symbols there. Valthrun told us about the Keep northeast of the village. Long ago, the Nerath Wizards sealed a rift to the Shadowfell and built a Keep over it. A garrison was left to guard the Keep, with a knight named Sir Keegan in charge. One day, Sir Keegan began slaughtering everyone in the Keep, without reason. The garrison was eventually able to drive Sir Keegan away, but at great cost. Now, the Keep lies in ruins, and is infested with Goblins. 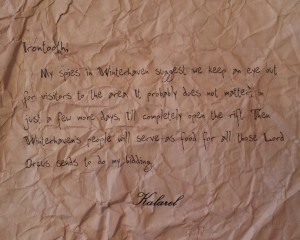 To this day the people of Winterhaven avoid the Keep and any mention of it. Delphina Moongem is the only person known to visit the ruins. Valthrun believes that the rift in the Keep leads to the domain of Orcus, the demon lord of undeath. He also believes that the mirror belonged to the Nerath Wizards, and may contain a way to unseal the rift. He identified the figurine as a symbol of Orcus, and then expressed dismay, proclaiming that there had been no evil cults in Winterhaven for more than one hundred years. He believes now that there may be a death cult in the area. Larksong asked about Kalarel. Valthrun did not know the name, but said that death cults are typically led by high priests and acolytes, and supposed that Karalel must be one of these. Leshanna, believing Valthrun to be hiding something, tried to intimidate him into revealing his secrets. Valthrun became offended and asked us to leave. As we made our way out, Larksong hid in the tower, to spy on Valthrun. I lurked about outside the tower to keep an eye on Valthrun while the others went to check on Douven Staul. Soon, Valthrun came out of the tower and headed towards the barracks. I followed, but once he entered the gate there was no way for me to slip through without being seen. I waited outside the barracks until Valthrun came back out with Rond Kelfem. As they walked to the tower, I let out a bird-cry whistle to alert Larksong. Larksong was able to squeeze through a window and fly down unnoticed. Soon Captain Rond exited the tower and went back to the barracks. Larksong and I, learning all that we could, returned to the inn to meet up with the others. Leshanna, continuing her ruse, got close enough to Agrid to threaten him. She grabbed him and touched his neck with her wrist blade, drawing a tiny bit of blood. She then told Agrid a fearsome tale about the Drow ritual of Mylthar, which she would perform on him if he did not tell us where to find Douven Staul. Agrid was obviously frightened, but claimed not to know any Douven Staul, or where he might be. Leshanna released Agrid and he stumbled away, clearly cowed. The dragon-like guards at the entrance, however, were unfortunately not frightened at all, and proceeded to attack Leshanna. Once out of her reach, Agrid yelled “Kill them all, Kalarel will reward us well!” Orsik and Larksong moved in to help Lashanna, while I charged at Agrid, swearing my Oath of Enmity. It was a very close fight, but we were once again victorious. Agrid was wearing a locket, which upon opening revealed a picture of Douven Staul’s wife. Leshanna also sensed magic in the locket, and believed it to be an amulet of protection. The crate which so excited the workers contained an unremarkable, dirty mirror. It appears to be very ancient, but not magical. A sack in one corner of the burial site proved to contain the unconscious and badly wounded Douven Staul. There was little that we could do for him at the burial site, so we stabilized him and are now proceeding back to Winterhaven. After defeating Irontooth in the Kobold lair, we thoroughly explored the caverns and discovered a treasure room. Inside, we found a small iron cage with a Pixie inside. The Pixie introduced herself as Larksong, and begged us to release her. Fearing a trap, we were hesitant at first, but then the Pixie began to sing and all of our worries melted away. We freed Larksong from the cage, and she has even agreed to join our party. Tired and battle worn, we decided to make camp rather than risk to long trip back to Winterhaven in the dark. Orsik fortified the treasure room door and set wards, then we all bedded down for a much needed rest. In the morning, we carefully made our way out of the cave and headed back to the road without incident. On the way to Winterhaven, we encountered a caravan. They were well armed and battle weary, but more than willing to trade with us. Back in Winterhaven, we immediately set out for an audience with Lord Patraig. We were told to wait at the inn, where we overheard that Valthran and Ninaran had gone to investigate the burial site, where Douven Staul is believed to have vanished. Presently we were joined by Lord Patraig and Captain Kelfem. They were as disturbed as we about the possibility of spies in Winterhaven, but could give us no clues about the identity of either Orcus or Kalarel. After collecting our reward, we set out for Valthran’s tower. No one answered our hails, and the door was locked. Leshanna tried to discern whether any magic had been used recently, and was thrown to the ground by a powerful ward on the tower. It seems that Valthran is more than a simple scholar. “We are looking for you,” I replied, and turned to face Ninaran. She hissed in surprise, but seemed agreeable to see us. Valthran came out from concealment and greeted us as well. They told us they had seen four or more humans at the burial site, and wishing to avoid a confrontation were on their way back to Winterhaven. 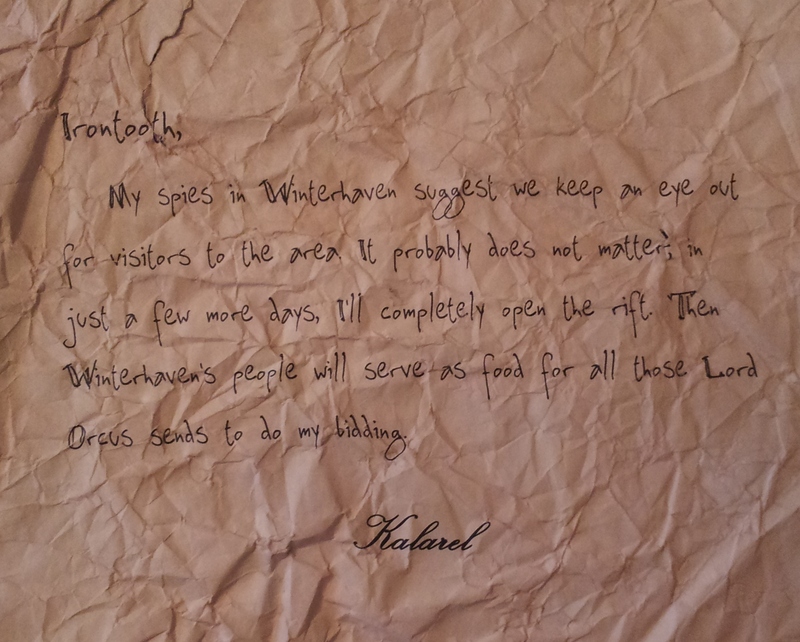 Valthran also told us he has important information about the keep Northeast of Winterhaven, and we should come to his tower tonight. And with that, he and Ninaran left us. We set off in the morn for the long voyage to Winterhaven! We made sure that we would have everything we needed (food, water, light, ale, etc…) and made haste. Around midday when the sun was at its highest, these wee little vermin bandits ambushed us for our ale! We made quick work of them, but the last one managed to hit me head with a sling then I went down. I wasn’t down for very long, for that big dwarf shaman, Niva, healed me right up when we killed those vermin. After the battle we looked through the bandits things and I took the sling that knocked me out to use against future foes. All in all it was a good fight, I was a little sad I missed the end. I hear that that emotionally unstable eladrin took care of them while we were taking a wee nap. I hope your travels have treated you well. I come with ill news. My husband and your master, Douvenstaul, went off on one of his quests some time ago and I am truly worried for his well-being. He said that he was going to a dragon burial site near Winterhaven. I don’t wish to trouble you, but if you could be so kind as to bring him home to me I would be forever grateful. My companions immediately agreed that we shall make our way to Winterhaven in the morning. After learning as much as we could from the good people of Winterhaven, we struck out for the Kobold lair to the Southeast. Once again, we were ambushed on the path, only this time we were expecting it. We made short work of the cowards, and claimed a dragon figurine from one of the marauder leaders. On the bottom of the figurine was a curious sigil — a skull with ram horns. Proceeding on to the Southeast, we spied several Kobolds and two Dragonshields guarding the entrance to what could only be the Kobold lair. This time we were the ambushers, and managed to slay most of the enemy while driving the Dragonshields back into the lair. The heat of the battle upon us, we pursued the vile beasts into the dank caverns. Irontooth himself, the hated Marauder leader joined the battle and very nearly turned the tide. In the end, however, we overcame and vanquished the enemy. My spies in Winterhaven suggest we keep an eye out for visitors to the area. It probably does not matter, in just a few more days, I’ll completely open the rift. Then Winterhaven’s people will serve as food for all those Lord Orcus sends to do my bidding. This is terrible news indeed. But who are the spies? Who can we trust?